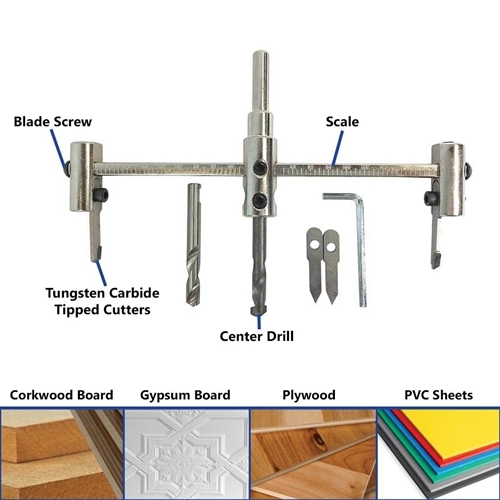 Kaufhof CIR-Pilot Adjustable Circular Saw Replacement Bit is a replacement Pilot Bit which is compatible with CIR-3,CIR-300,CIR-300K ,Will cut plywood, laminates, composite boards, gypsum board, plastic, rubber, & many other material . Kaufhof CIR-3 Adjustable Hole Saw Circular Cutter ranging from 1.5"(38.1mm) up-to 7.8"(198.12mm) .Will cut plywood, laminates, composite boards, gypsum board, plastic, rubber, & many other material with extreme precision .Includes extra brad point drill bit for drilling in thin sheet materials, and Allen Wrench for adjustments. 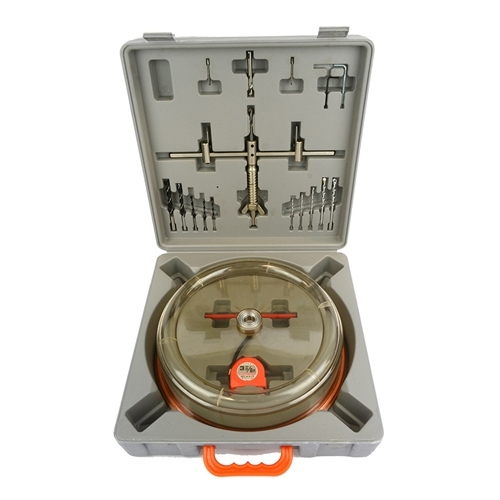 Kaufhof CIR-300 Adjustable Hole Saw Circular Cutter ranging from 1.5"(38.1mm) up-to 11.8"(299.72) .Will cut plywood, laminates, composite boards, gypsum board, plastic, rubber, & many other material with extreme precision .Includes extra brad point drill bit for drilling in thin sheet materials, and Allen Wrench for adjustments. 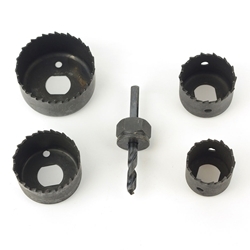 Material: M2 alloy Steel blades and drill bit. 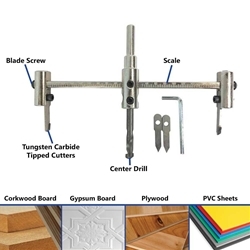 Kaufhof CIR-300K Adjustable Hole Saw Circular Cutter ranging from 1.5"(38.1mm) up-to 11.8"(299.72) .Will cut plywood, laminates, composite boards, gypsum board, plastic, rubber, & many other material with extreme precision .Includes extra brad point drill bit for drilling in thin sheet materials, and Allen Wrench for adjustments. Comes along with a dust collection Kit. Note : Not for use on sheet or other metals. Big Horn 19238 Adjustable Hole Saw Replacement Blades - 2Pcs/Pack. 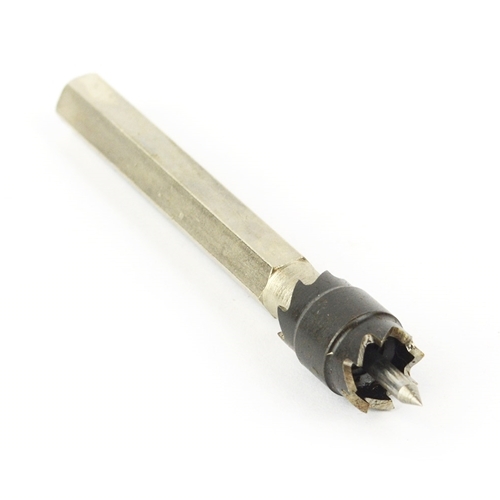 Kaufhof RM1905 3/8 Inch Double Sided Rotary Spot Weld Cutter.Use this spot weld cutter drill bit to easily separate spot-welded panels, without distorting the sheet metal. The weld cutter’s double sided 3/8" rotary cutter blade fits most 1/4" drills and separates spot-welded panels more effectively than a panel cutter. This great spot weld cutter is a great addition to the tool kit of any welder!